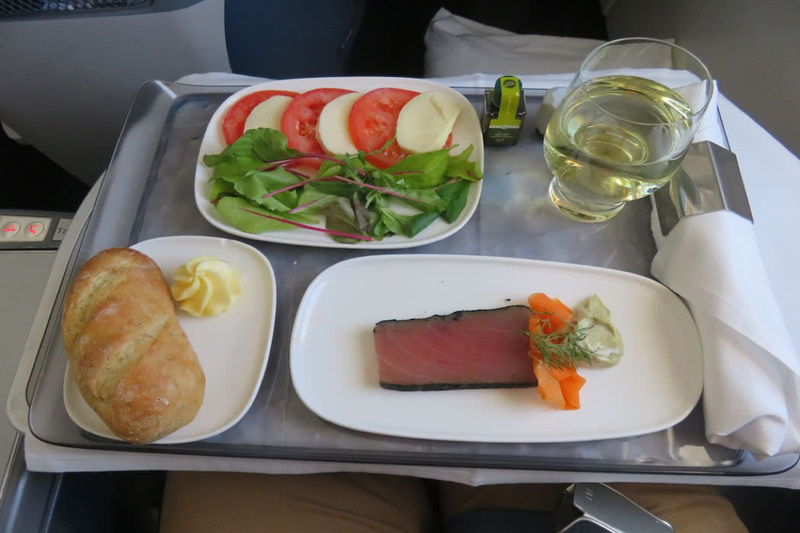 In September, I reviewed my flight in Business Class on Delta Air Lines Boeing 767-300ER from Brussels in Belgium to JFK Airport in New York. You also can read my other Business Class flight reviews on Delta. Delta is the oldest airline in the USA and is Delta is the world’s second largest airline in terms of scheduled passengers carried, revenue per passenger per mile flown and fleet size (after American Airlines). 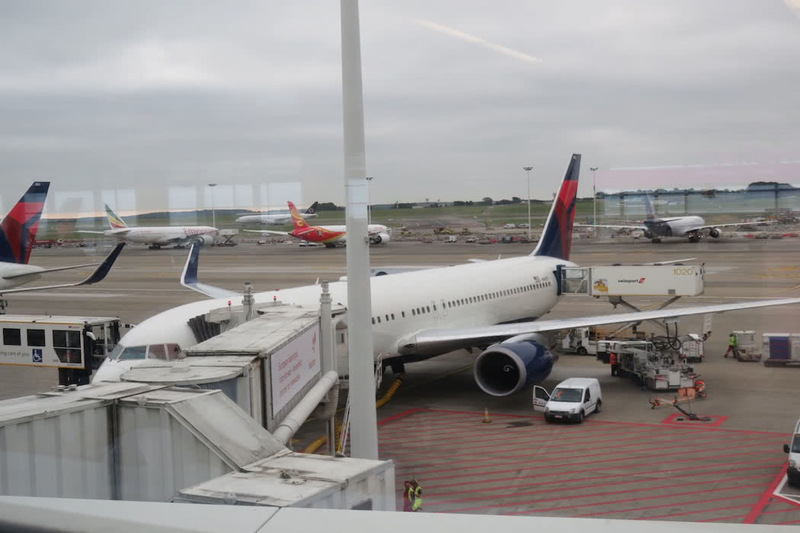 Delta’s fleet includes almost 900 aircraft. Delta is known for its policy of generally buying older generation or used aircraft and for continuing to fly aircraft for 20-30 years, much longer than most other major airlines. As such, it has one of the oldest fleets of any American airline, with an average fleet age of 16.3 years. Delta’s Boeing aircraft make up about 57% of its fleet, while its Airbus aircraft makes about 27% and McDonnell Douglas aircraft makes up about 16%. Delta is the world’s largest Boeing 767 operator. More importantly, did you know that Delta is also the largest transatlantic carrier, with more transatlantic flights per day than any other carrier. Yes, it’s true, they fly more flights across from their home in America to various airports across Europe, with particular emphasis to capital cities like London, Paris, Frankfurt, Berlin, Rome, Madrid and of course, Brussels. The B767 is the backbone of Delta’s transatlantic fleet, and while a journey onboard Delta’s B767 Business Class (called Delta One) still offers a comfortable ride, the seat feels dated when compared to modern Business Class cabins, including Delta’s own brand new Delta One Suite which is only found on its brand new A350 aircraft only. This means that when you fly transatlantic on Delta you should always choose to fly on their A350 planes and not any of their other aircraft. 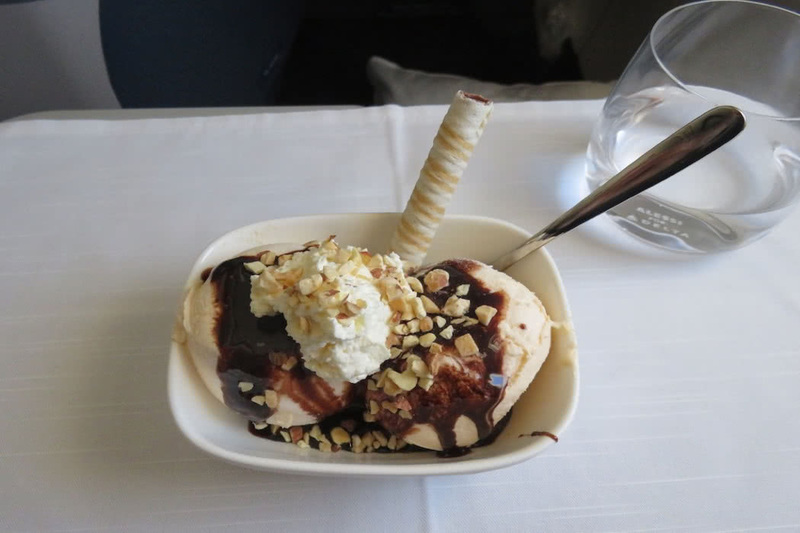 If you only have the option of flying Delta’s B767 Business Class, it is worth considering booking with another airline such as American Airlines which offers a better Business Class overall and certainly a better Business than Delta’s B767 Business Class. Usually, American’s seats are larger and more comfortable plus the seats don’t make annoying mechanical noises; what was Delta thinking!? The cost of my return ticket was 1250 euros in a flash sale with a 50% discount, which is a greats price for a Business Class flight Europe to the USA return. Remember, if you are planning to book a First or Business Class flight or a luxury hotel, contact our luxury travel concierge to get a quote before booking. We offer free upgrades, free breakfasts, deals and can highlight special deals to you on your preferred route. 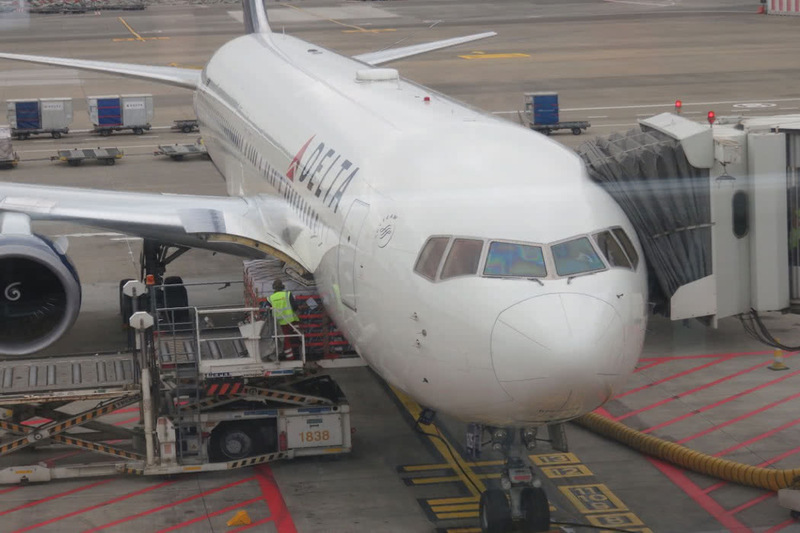 If you are based in the US our friends at upgraded points have outlined the 18 best ways you can earn lots of Delta SkyMiles so that you can fly for free. 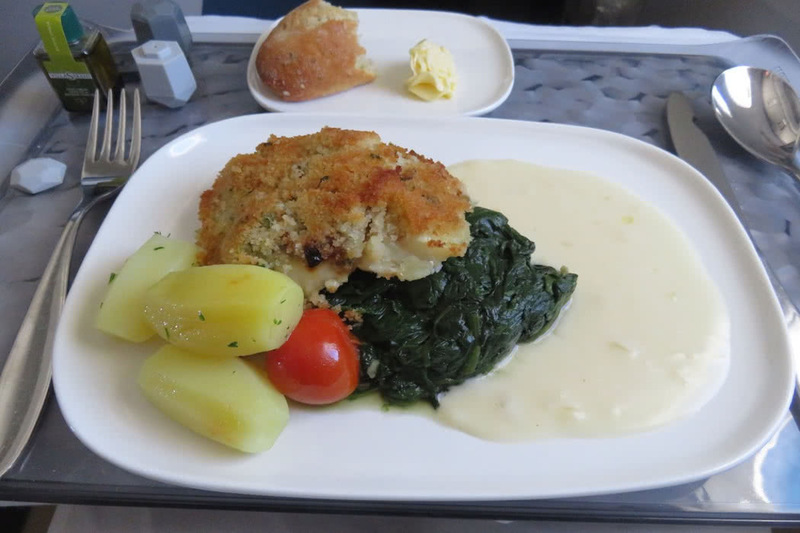 I travel on British Airways Avios for free accrued on by my FREE Amex Gold Card. I convert my American Express Rewards directly to airline miles so that I can fly about exclusively on these. Contact me if you would like a referral bonus for this card. 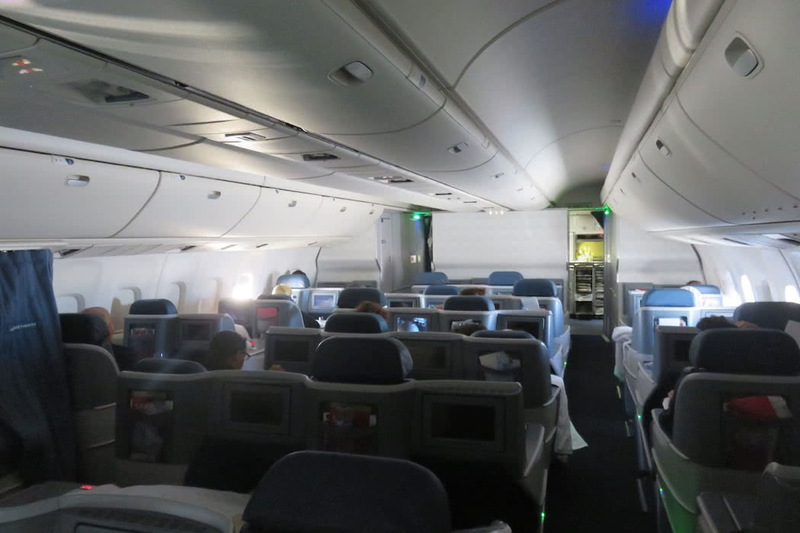 My flight from Brussels to New York was operated by a high-density Boeing 767-300ER that featured 26 lie-flat Business Class seats spread over 7 rows in just one cabin, which was located in front of the Economy Plus Class cabin. All of Delta’s B767s feature a Business Class cabin with a staggered seat layout, whereby the foot compartment for each seat is located between or under the seat(s) ahead. This means that all seats face forward and enjoy direct aisle access. Since none of the rows line up, nobody is directly looking into the seat across the aisle. The middle seats all come in pairs (separated by a large armrest) while the window seats are all single seats. These window seats alternate between ‘real window seats’ (with a large armrest between the seat and aisle) and ‘aisle seats’ (with only a narrow arm rest between the seat and aisle). Those aisle seats are not as enjoyable as the real window seats and will feel occasionally disturbed by passengers and crew in the aisle during the flight. 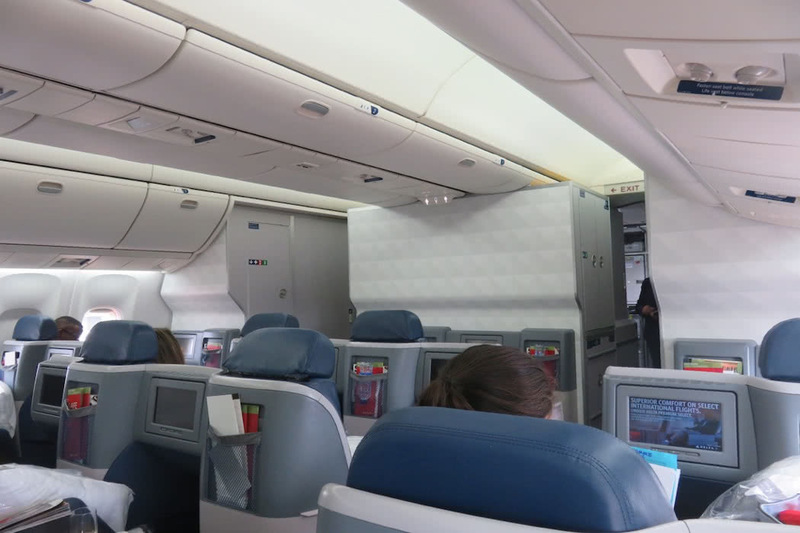 The design of Delta’s B767 Business Class cabin is not great. The carrier has introduced the walled cocoons with sliding doors of the Delta One Suite on its newly delivered A350 aircraft, which are some of the best Business Class seats in the industry. But much of the fleet delivers a much worse product with dated seats, very few real window seats and generally a poor effort at Business Class. Which Seat Did I Select? 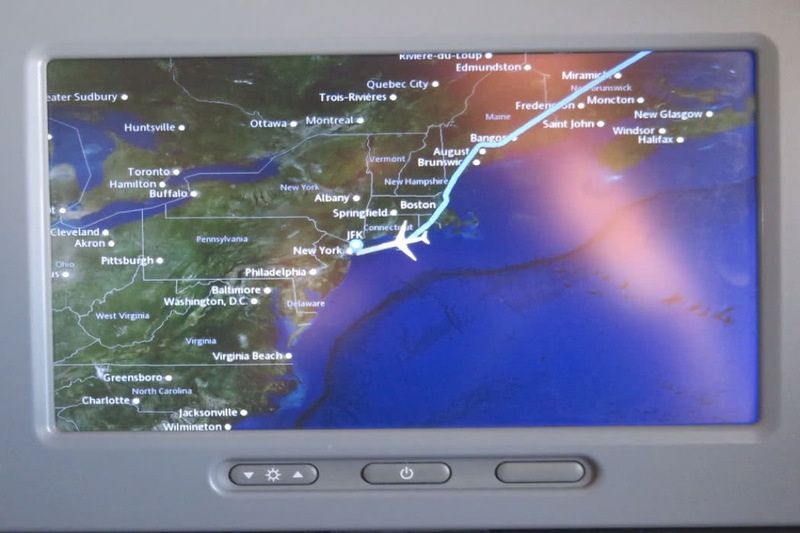 I had selected seat 3D, a window seat, for the 7 hour 45 minutes flight to New York. This Delta B767 Business Class seat is 21 inches (53 cm) wide and has a pitch of between 76 and 81 inches (193 to 205 cm). The seat has a large armrest on the side, which holds the foot cubby of the seat behind it and can be used as a working surface. There is also an in-seat massage function if you like this kind of thing! A foldable tray table is stored in the armrest and there’s a panel with a universal power port, a USB ports and a small personal reading lamp. The seat is comfortable when you are sitting upright, but not in the lie-flat position because your lower legs descend into a box carved out for it in the armrest of the seat(s) ahead, below the entertainment screen. This footwell is small, so your feet will hit the walls of this space as you try to switch position during your sleep. It is worth noting that single seats on the side have considerably more space for the feet than the paired centre seats. The lowness of the seats is also a pain in the bum as they sit just 45 cm (17 inches) above the floor when in sleeping position, making it uncomfortable to get up and down from. The seat also has two other disadvantages: it lacks adequate storage space and it is moved by small motors, so you hear a weird noise every time you (or the passengers around you) adjust the seat position or activate the massage function. 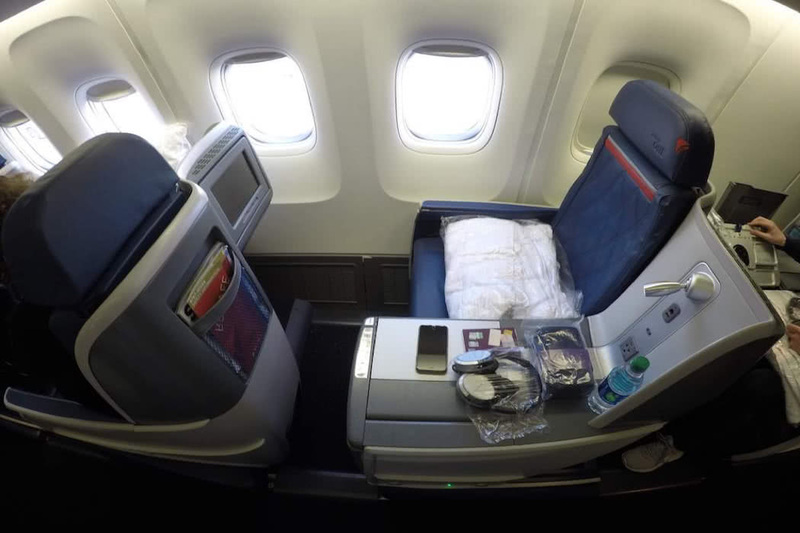 What are the best Business Class seats on Delta’s B767? The best seats for solo travellers are the single seats on the side, especially those that are separated from the aisle by the wide armrest. Couples should go for the paired seats in the middle. 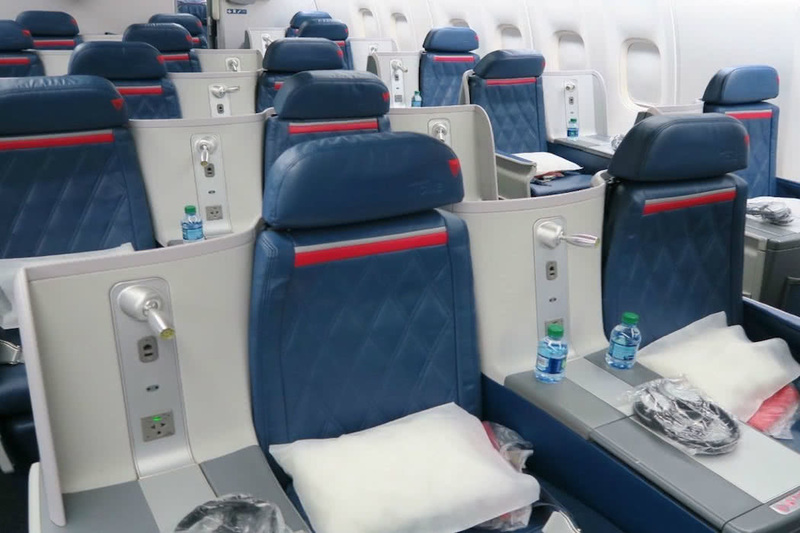 What are the worst Business Class seats on Delta’s B767? Some of the solo seats on the side have their wide armrest located next to the window, with only a narrow armrest between the seat and the aisle. These seats are not as private as the real window seats, and it may feel like you are seated in the middle of the aisle as you will be disturbed by passengers and crew passing by. The Delta Amenity Kit Is great! You get a silver hard-sided TUMI amenity kit outbound from the USA and a soft-sided black TUMI amenity kit inbound to the USA (so you can add a variety to your amenity kit collection each way). 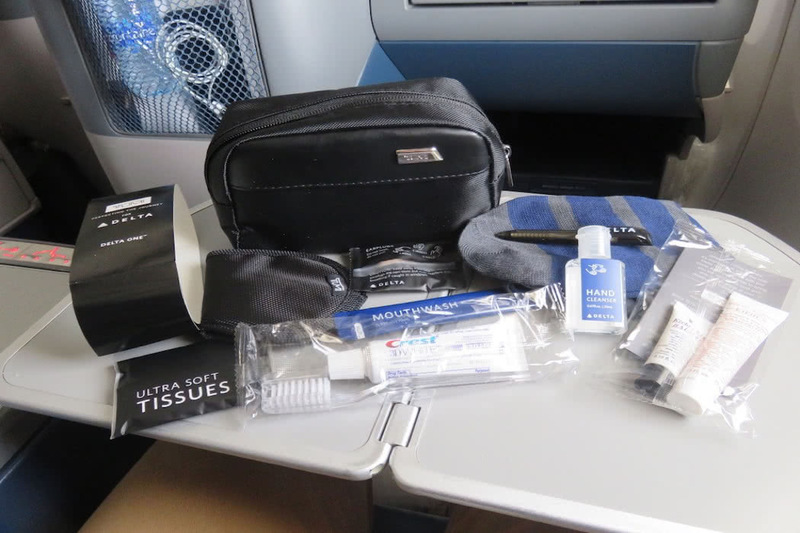 The kits feature travel essentials including Kiehl’s lip balm (my favourite) and grapefruit-scented deluxe hand and body lotion with Aloe Vera and Oatmeal, a dental kit featuring Crest toothpaste, tissues, mouthwash and earplugs. 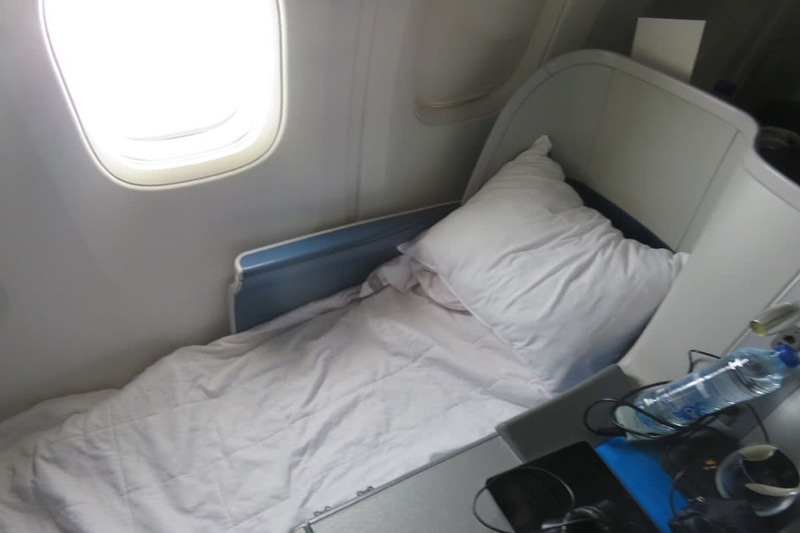 Pyjamas are not offered in Business Class, except on Delta’s routes from Los Angeles to Shanghai and Sydney. Delta’s also supplies noise-cancelling headphones are from Los Angeles-based sound and philanthropic company LSTN Sound Co. but these can’t be taken home with you. Starter: Black Forest tuna with dill cream and pickled carrots. Salad: summer tomato and fresh mozzarela salad with mixed greens. Main course: Flemish cod with lemon beurre blanc, parsley potatoes, and sautéed spinach. Dessert: vanilla ice cream sundae with your choice of sauces, nuts and whipped cream. I had never heard before of Flemish cod (and I live in Flanders) nor did I know that tuna lived in the Black Forest. The food was, however, very tasty although not special. The meals were served on stylish tableware by the globally renowned design company Alessi. 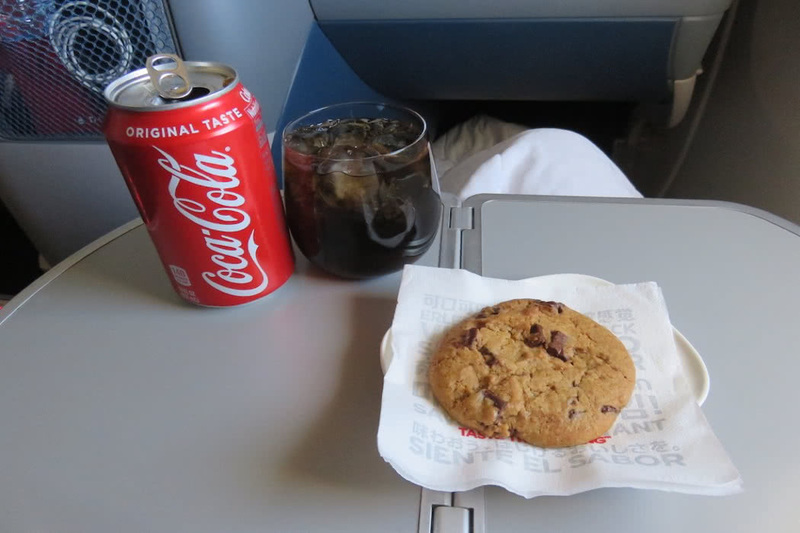 Then, about 90 minutes prior to landing came the second, light meal service. I choose a hamburger, which was served on a brioche bun with lettuce, tomato and cheese. 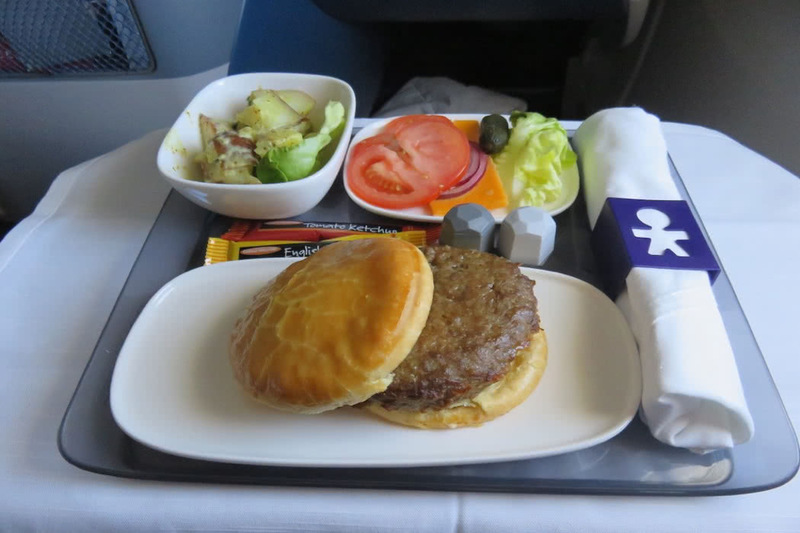 It was the first time I had a hamburger on a plane, but it tasted good! 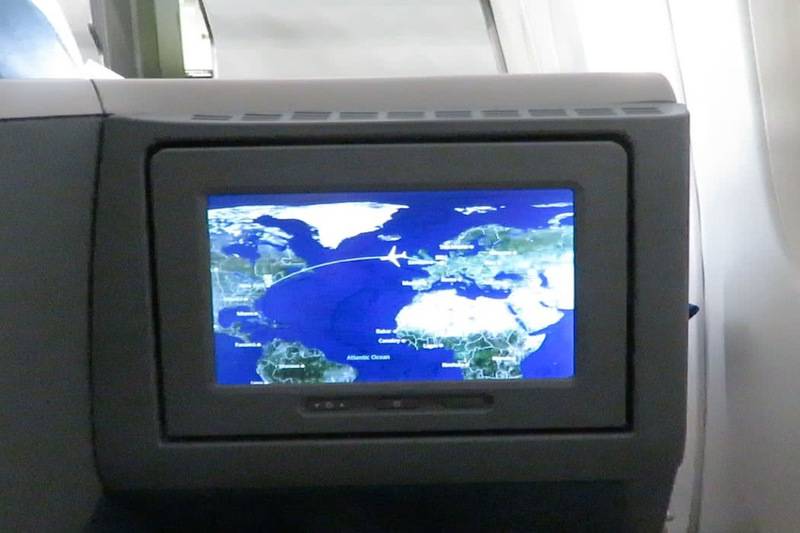 Each Business Class seat features a TV screen mounted in the back of the seat ahead. The screen is quite small (13 inches), which is similar in size to the entertainment screens in Delta’s Premium Economy Class (where the seats are closer to the screen, hence making for a more enjoyable entertainment experience). In comparison, Delta’s new A350 suites feature much larger, 18 inch TV screens, representing a huge improvement. Delta’s entertainment, Delta Studios, is excellent, with a large library of movies (around 300), TV shows (around 800), audiobooks, video games and even live satellite TV. You can view the shows on the seat’s entertainment screen, or alternatively, stream the entertainment to your own mobile phone or tablet. Delta’s flight attendants are considered the friendliest of all USA airlines. The cabin crew on this flight was very outgoing and enthusiastic. I told them about my fear of flying over water, and I was offered a flight map, a gesture which I genuinely appreciated. There are 2 toilets for the 26 Business Class passengers, both of them located behind the cockpit and were kept clean if basic for Business. Review by our friends at The TheLuxuryTravelExpert.